A tracking program for all of life's ups and downs®. 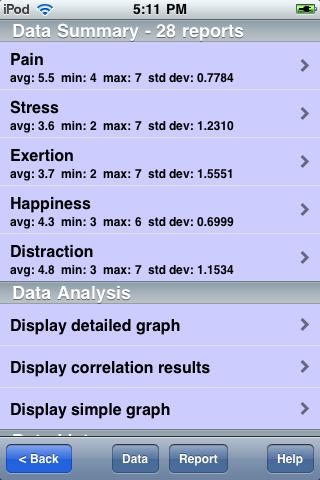 LifeLog allows you to easily keep track of any data, and analyze the results. It is designed primarily to help you determine what in your lifestyle is affecting your symptoms, whether for good or ill. Is your headache worse or better when you are under stress? (Many are better!) Is your weight affected by how much you sleep? Does your shoe color affect your mood? How effective is your therapy? You can select to measure anything, using any scales (e.g. 0 through 10, or 0 through 500), with up to 16 values per set. 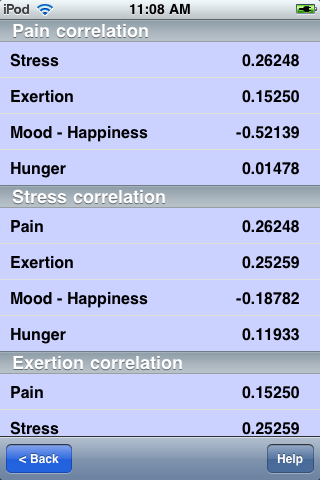 Whether the issue is insomnia, pain, or something psychological, LifeLog can help determine what factors may be contributing, and what factors are probably unrelated. LifeLog is designed to be very easy to use on an hourly or daily basis, and yet provide sophisticated data analysis and reporting tools right on your iPhone or Touch. Entering data takes just a few taps. A few more taps will result in graphs, charts, and an HTML report you can email to your home computer, or to anyone else. You can also upload a report to a private page on the LifeLog website, accessible via a passkey. 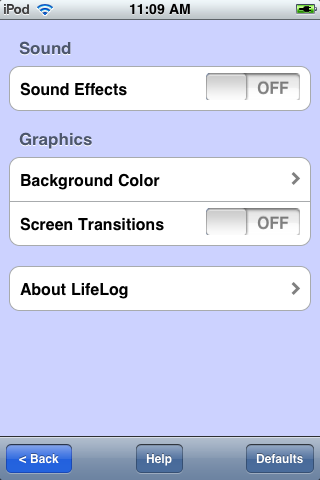 LifeLog is fully customizable. You can utilize a variety of templates to organize your slate of symptoms to track, and then customize it, even after you have started tracking data. You can have multiple slates active at once, for multiple problems and/or multiple users. Each slate can track up to 16 conditions. You can specify the range of accepted values for each question, from as little as two (yes/no) to 500. Plus, each slate can optionally be password protected. LifeLog is flexible. It can be used to collect data for any purpose, whether it's personal conditions, scientific experiments, engineering tests, or for collecting any data where cause-and-effect may not be obvious. The questions and the prompts are completely customizable. The raw data can be exported and emailed for processing and display on your computer. LifeLog is not designed to replace the advice of your doctor, nor should it be relied on for a diagnosis. However, your doctor may find the collected information useful. Track up to 16 variables that you define using a simple user interface. Specify the data range, from two to 500 choices. Enter data daily, hourly, or any time you want. The analysis software compensates for (normalizes) irregular data entry. Add a comment to any entry. Add, remove and edit variables at any time. Displays a graph of all or selected variables over time. Shows the average, minimum, maximum, and standard deviation for each variable. 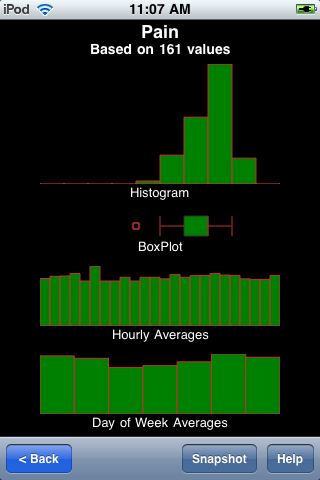 Shows a histogram, box plot, hourly averages, and daily averages for each variable. Shows the correlation values of every pair of variables, to determine if any are linked (e.g. Stress and Pain). Creates a web page report that you can email to any recipient(s), or post on your private LifeLog web page. Displays a list of all entries, including comments. You can define more than one set of variables, for multiple users, or for different situations. 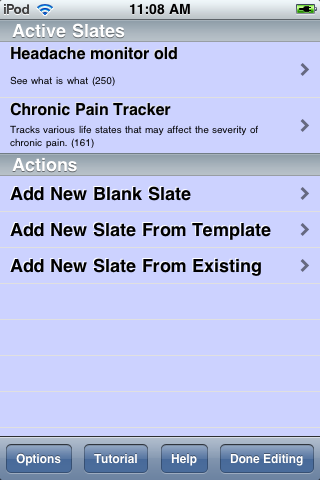 Templates provided for common situations, such as pain management, insomnia, mood tracking, etc. 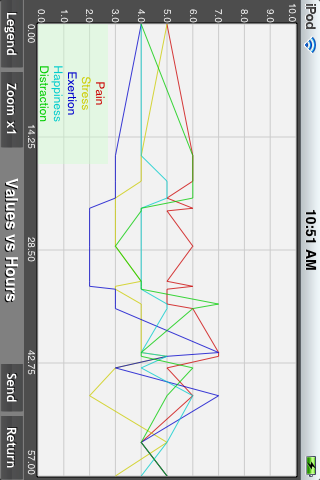 Save screen shots of the graphs and charts to your photo album. A help screen on every page. Options for sound and graphics. Backup and restore (from the Options screen). Weekly calendar interface (select Calendar from Options). Please email lifelog@mikeberro.com if you need personal assistance. Otherwise, visit the LifeLog community forum at http://LifeLog.yuku.com/ to post a public message. Copyright 2009-10 by Mike Berro. All rights reserved.